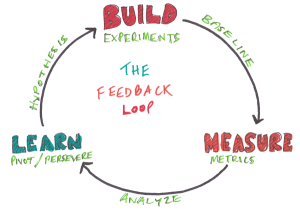 One of the things that I feel that makes certain people and organizations tick while others don’t is ‘The Feedback Loop‘. I believe most(all?) successful people/companies have a good feedback loop which helps them gather external information, couple it with internal hunches/insights and improve their course of action/style of working. Watch videos, join an online course, study tutorials, read a book or use an interactive app. Most people are not good at taking direct feedback and thus end up seeking only the indirect feedback if at all. Which needless to say is less efficient. They are anti-feedback types, every time honest feedback about their abilities is pointed out, they start looking in opposite direction. If only they could set their egos aside and taken in as much as they can without bothering the form and source.I’d blindly side a guy who has figured out a way to improve themselves/their work on their own. At a organizational level, there are various sources of feedback, namely employees, customers, partners, investors(if any). If you don’t have a process of continuously seeking their feedback, logging data in a structured format, analyzing it and using the insights to improve the ways things are done, you are missing out a lot. Got any thoughts on ‘Feedback Loop’ for individuals and organizations? This entry was posted in Uncategorized and tagged business, feedback, learning, life, loop, self-improvement, startup, testing on December 29, 2013 by mayank.